The Eat Beautiful: Grain-free, Sugar-Free and Loving It cookbook contains everything you need to get started, including delicious recipes, helpful tips and inspiration~ featuring over 100 recipes free from grains and sugar. 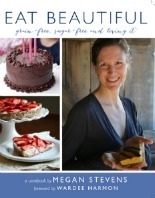 EAT BEAUTIFUL: Grain-free, Sugar-free and Loving It is a cookbook. 288 pages of recipes and inspiration, well suited for Paleo diets, as wells as GAPS, AIP, anti-candida, Weston A. Price and more.